Located just west of downtown Chattanooga, Cameron Hill, the mirror image of Lookout Mountain, has a rich history. Given the hill's proximity to settlements along the Tennessee River and the intersection of major trails to the south, Native Americans were certain to have used the promontory since prehistoric times as an observation point. At the time of the Cherokee Removal in 1838, the state of Tennessee began selling the newly vacated land of the former Ross's Landing. Businessman James Whiteside purchased much of the top and east side of Lookout Mountain as well as what became Cameron Hill. He built a mansion on Lookout Mountain and an in-town home on the north side of the hill. While visiting Philadelphia, Whiteside met artist James Cameron, a Scotsman who studied in that city and in Italy. Whiteside persuaded the artist to come to Chattanooga and helped Cameron obtain commissions. The artist's best known work was the 1859 painting of the Whiteside family on the terrace of its Lookout Mountain home. As payment, Whiteside gave James Cameron the hill, where the family built a home and studio — and gave its name to the high ground. The remainder of Cameron Hill was covered in old growth forest. When the Civil War broke out, the disillusioned Camerons left for Philadelphia. Chattanooga was in the hands of the Confederacy until August 1863, when Union forces under the command of Gen. John Wilder advanced on Chattanooga from the west. In response, Gen. Braxton Bragg's Confederates attempted to defend the city from a fort on Cameron Hill. The antiquated Confederate artillery failed to protect the city from the Union barrage from Stringer's Ridge. The Confederates vacated the city on Sept. 9. 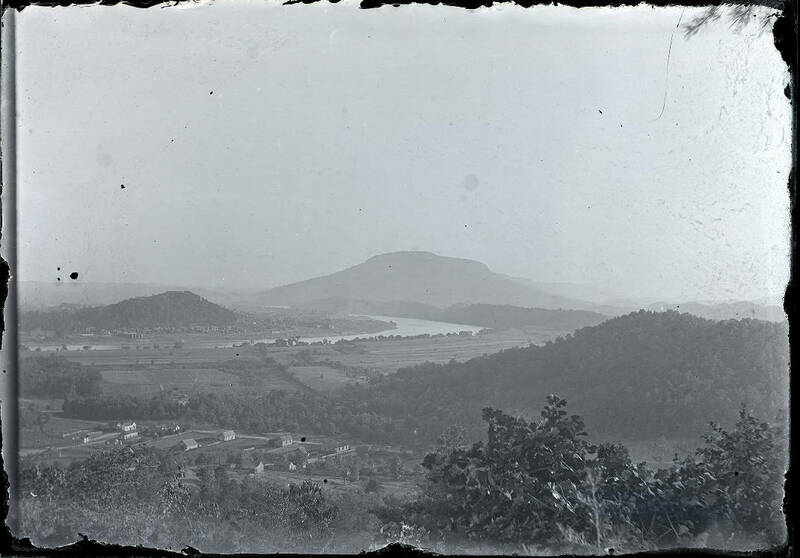 Following their defeat at Chickamauga, Union troops retreated to Chattanooga to find themselves surrounded by Confederate forces controlling Lookout and Raccoon mountains, Missionary Ridge, railroad routes and the Tennessee River. During the two-month siege, the Federals relayed messages via flags on Cameron Hill to troops on Signal Mountain. Meanwhile Union soldiers cleared the hill of trees to build a bridge across the Tennessee River. Eventually even the tree roots were stripped from the ground and used as firewood by cold, hungry soldiers. James Whiteside died from pneumonia in 1861 after retrieving his son from a Confederate hospital. During the Union occupation his widow, Harriett, and her young children were deported north. They left most possessions behind, including the Cameron painting, which was later wrapped around a pole and shipped to Cincinnati. It was eventually returned to the Whiteside family and today hangs in the Hunter Museum of American Art. James Cameron died in 1882 in California. His widow sued the federal government for the value of the lumber cut by Union forces and was compensated $30,000. After the war, Harriett Whiteside began re-establishing control of her late husband's estate. In 1886, a plot of residential lots on the hill was sold at auction. Prominent Chattanoogans, according to The Chattanooga Times, built "handsome, stylish homes on the slopes of the hill, making the area one of Chattanooga's most fashionable neighborhoods." In 1888, a group of investors purchased the top of the hill. They built Chattanooga's first incline and then a casino and beer garden. An early photograph shows the casino on the top of the still-denuded hill with homes on its slopes. In 1891, of group of citizens tore up the incline tracks. The casino, which was never popular with city residents, soon went bankrupt and closed. In 1905, the city named a park on Cameron Hill in honor of Union Gen. Henry Boynton. A veteran of the battles of Missionary Ridge and Chickamauga, Boynton received the Medal of Honor for his actions at the ridge and in the 1890s became chairman of the committee that oversaw the development of the Chickamauga and Chattanooga National Military Park. The 10-acre Boynton Park featured a concert pavilion, flowering cherry trees, roses, irises and violets as well as Civil War cannons and markers. It was the site of Fourth of July fireworks displays as well as romantic strolls, picnics and outings. Trees were planted on the still barren hillsides, thanks to City Alderman Isaac Mansfield, who did the planting at his own expense. By the early 20th century, Cameron Hill was a jewel in the heart of Chattanooga — an elegant neighborhood with a lovely park. - Coming next Sunday: The changes that led to the Cameron Hill of today. Gay Moore is the author of Chattanooga's St. Elmo and Chattanooga's Forest Hills Cemetery. Visit Chattahistorcalassoc.org for more information.